Our Morgan Hill hydro-jetting professionals are always standing by to give you a helping hand with your drain and sewer system cleaning needs. When you have drain problems in your home, you can get everything running smoothly again with Morgan Hill hydro-jetting services. This professional service is highly effective at removing blockages and greasy build-up inside drain and sewer lines. Before you use another chemical, you should learn more about hydro-jetting in Morgan Hill to see if it can help you resolve the issues with your plumbing lines. We’ll start the process with a video inspection to identify the cause of the problem. While hydro jetting in Morgan Hill and Campbell are excellent ways to clear out tree roots, a snake may need to be used tear up very heavy roots. If pipes are broken or weakened, then this service can exacerbate the problem and other repairs will be required. We offer Morgan Hill hydro jetting services for commercial and residential properties. We’re able to use high pressure water jetting to quickly remove sand, scale build-up ad silt. Hair clogs and grease from cooking are no match for our professional services. While snaking out the drains will break up large clogs and allow the water to start moving again, only Los Gatos and Morgan Hill hydro-jetting will actually clean the walls of the drain lines without the use of any harsh chemicals. This is an environmentally friendly service that’s safe for use on all types of lines. Without any remaining residue to serve as the basis for another clog, you can be confident that your clean drain lines will continue working properly for years to come. 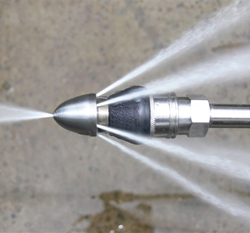 You don’t have to wait for a problem to call for hydro jetting in Morgan Hill. This can be an important part of your household maintenance. With regular drain cleaning, you can be confident that problems are not slowly building and developing in the lines. The service is reliable and safe. If you’re ready to protect your drain lines or address clogs, then start with an assessment for San Jose or Morgan Hill hydro jetting services. Provided your lines are intact and still strong, they can be treated with the high water pressure to cut through debris, roots, and grease. With hydro-jetting in Morgan Hill, you can avoid more costly repairs and have the peace of mind that comes with knowing your drain lines are in top condition. Regardless of your reasoning and needs for high pressure water jetting services, we’re here to help. Give our professional team of Morgan Hill hydro jetting plumbers a call at (408)215-4612 to schedule service today!